PDF editor adds digital signature support, audio annotation, measuring tools, and offline Word export. Portable Document Format (PDF) files are ubiquitous, and we’re often called upon to fill them in, or have the strong desire (or a job requirement) to mark them up and pass them on to other people. Apple’s Preview has decent core PDF support, but it’s often frustrating to use and its annotation and editing tools are weak and basic. Adobe, the creator of PDF, will sell you or rent you its Acrobat software, which is expensive and powerful—and remains baffling across each of the multiple major revisions it’s made to the user interface over a decade. This is why I’ve turned to Smile’s PDFpen and PDFpen Pro for many years. Version 8 is now out, and it builds on existing strengths, offering high-end features without a sky-high price: It’s $75 for the regular edition and $125 for Pro. (Multi-license pricing is available.) PDFpen Pro includes all of the basic PDFpen’s features and adds a wide variety with more niche appeal, such as Excel file export and autogenerated form fields. The OS X software is both full-featured and generally intuitive. Both editions can create and edit the contents of PDFs, allows drawing and adding text on top of files, and includes excellent optical character recognition (OCR) software. 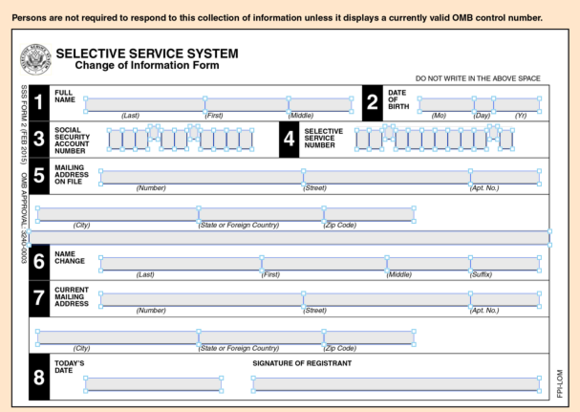 It’s also a superb way to design forms, retrofit existing documents to contain form fields, and to fill out forms. There’s a slight awkwardness in picking, setting values for, and switching among the app’s several tools, but it’s minor. The new version is a solid notch up from the previous release, adding a miscellaneous set of new useful features that bring it in closer parity to Adobe Acrobat. PDFpen now supports validating signatures signed by Acrobat and other software, as well as adding such verification itself. You can use certificates from Adobe’s Adobe Approved Trust List (AATL), which can cost from about $150 to $300 a year as an individual, as well as so-called self-signed certificates that you can create yourself. PDFpen even includes a process to create a self-signed certificate, which is useful for showing a document wasn’t tampered with but doesn’t help assure identity. PDFpen shows that a PDF is signed by displaying a triangular notch in the upper-right corner. If the triangle is green and has a checkmark, the app has verified it; clicking the corner brings up additional technical details. If it’s yellow with an X inside, you can click it and see that a self-signed certificate was used, and obtain more information about the certificate. 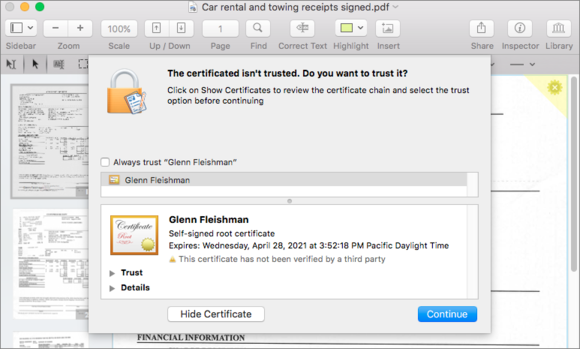 A self-signed certificate that hasn’t been manually marked as trusted causes PDFpen to show a yellow warning in the upper right. Signing works, too, but it’s a little wonky: You have to select Tools > Signature Field, click on a document, draw a signature (or at least click in a drawing field), and then click Apply Digital Signature, at which point you can select an existing certificate or generate a self-signed one. The latest version also adds support for measurement, a feature that’s part of the PDF spec, but is typically used only when architectural and other computer-aided design (CAD) software exports a PDF. With a PDF that embeds scale and units, the measuring tool displays those accordingly. But you can also use it with any PDF, where PDFpen uses the document’s explicit measurements (like 8.5 by 11 inches) as the basis of dimensions that you can opt to show in points, inches, or millimeters. PDFs can support file attachments and annotations, and PDFpen now fully embraces that, which is handy because it lets a PDF file act as a kind of portmanteau or a sticky-note festooned marked-up copy. PDFpen can extract file attachments and annotations, and also preview them. The basic PDFpen is more of a viewer while the Pro edition can add and delete attachments and annotations. Both versions also let you record audio annotations you can add to a PDF as well as play them back. PDFpen offered export to other formats in previous releases but required a round-trip through the Smile servers. This is a security risk and also requires being online. In version 8, both versions use a local converter to export a Microsoft Word compatible .docx file. I exported a complicated PDF that included a very detailed table and the resulting version in Word was almost pixel perfect and fully editable. The same PDF exported to Excel in the Pro release with equally well preserved tabular detail, including merging and spanning cells. If you need PowerPoint or PDF/A (an archived format of PDF) exports, those are also available in the Pro version, but still require a round-trip to Smile’s servers. PDFpen has seemingly nearly as many features and options as Adobe Acrobat, but I consistently find myself able to figure out how to accomplish what I want in PDFpen, while I often have to consult Web documentation and poke around in Acrobat to get to where I’m going. That’s partly because Smile chose to use a straightforward toolbar (introduced a couple of versions ago) mirrored in a Tools menu to spell it all out. In testing this new release, I went back and forth between PDFpen and Acrobat, and Smile’s software was a consistent relief to which to return. Like Acrobat, PDFpen is a rich PDF editor, letting you work with text, images, attachments, and annotations, and edit anything that appears on a page, including all of those elements. You can also delete objects, or redact parts of a document—this is true redaction, where the underlying data is removed, rather than just a black bar being overlaid. This toolset is also useful when you’re given a PDF, instead of generating it yourself, or when you’re working through revisions on a document that you’re handing back and forth among a team. You can select text to copy it out, or use a Correct Text feature to edit it. PDFpen’s one drawback relative to Acrobat is how it handles dropping in revised text. Acrobat can read embedded fonts, even ones that are subsetted (including only the characters used in the document), and your “touch ups” appear in the native font whenever possible. This preserves the appearance. PDFpen drops in a default font, which makes it impossible to use to make an aesthetically usable seamless fix. You can adjust this by selecting fonts installed in OS X, but it’s not nearly as useful. Both versions let you fill out form fields created in other software. If you need to make your own forms, the Pro versions can autogenerate form fields, or you can drop them in manually and format their appearance. Autogeneration is quite amazing: I threw scanned images—not just PDFs—at PDFpen Pro that had continuous lines with labels underneath for first, middle, and last name, and other similar entries, and it correctly broke those into separate fields. Pro can even embed a button into a PDF that allows someone filling it out to submit the form data or the filled-out PDF to a Web server or send either via email. PDFpen Pro can automatically generate form elements. When using OCR, you can view the original and select the recognized text, or you can reveal the text-only layer, which the Pro flavor can also edit in place. The OCR software is highly accurate, even for extremely degraded text. I tried it on old, newspaper pages with very small type, and it did remarkably well. On typewritten or computer-output, it’s nearly perfect in my testing. Once converted, you can search on the document or display the text in an isolated layer. The Pro version lets you correct the text, too. For those concerned about Smile’s move into subscription-based pricing with its TextExpander software, have no fears: PDFpen in both editions is sold as a one-time license fee. Single-user licenses are $75 and $125 for the regular and Pro versions, respectively, and family and multi-user business licenses are also available. Smile charges $30 for an upgrade to PDFpen 8 and $50 to move to PDFpen Pro 8. Yosemite or later is required. Smile sells directly and you can also buy PDFpen and PDFpen Pro via the Mac App Store. Upgrades can be purchased only directly, whether the previous version was bought from Smile or via the App Store, as the Mac App Store doesn’t allow upgrade pricing. However, if you purchase or switch to a directly downloaded copy, you can’t use iCloud syncing with Smile’s iOS PDFpen software. Both directly purchased and Mac App Store versions work with iCloud Drive and Dropbox. PDFpen Pro includes all of the features of the non-Pro version and adds a wide variety with more niche appeal, such as Excel file export and autogenerated form fields.